ASP Diliman was a featured participant at the recently concluded UP Spedminar called Transcend, organized by the UP Special Education Council of the University of the Philippines, College of Education to promote special education in the country. It was held last during the four Saturdays of September in the UP Diliman campus. Focused on “Preparing for the Real World through SPED”, Jo Palomares narrated their family’s journey with autism, with her son Macky, who is now 15 years old. She reminded all to “never, never, ever, ever give up” -- a message which resonated with parents, teachers and students. She continued by giving pointers and tips on parenting a child with autism. As a fitting end to her talk, Macky Palomares played “You raise me up” on the piano and earned a standing ovation. About the author. 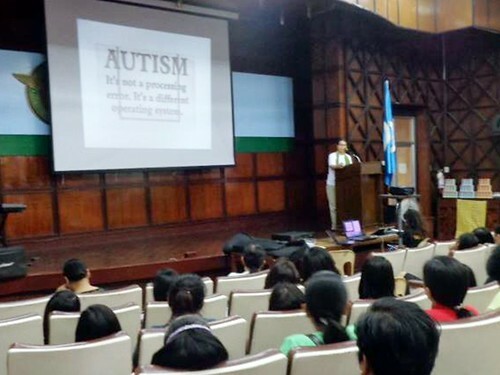 Jo Palomares has long been the face of autism advocacy for ASP Diliman chapter. After serving as the President of the chapter for multiple terms, she continues to serve the disability community as she leads the Kaakibat ng ASP Quezon City Credit Cooperative; and contributes as an active member of the Association for Adults with Autism. She owns and personally manages a thriving model airplane export business in Bulacan. Her son Macky is on the spectrum.